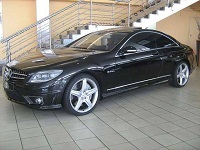 2009 +/- 9.100 Km's, Balance of 6yr/120 000km m/plan, Immediately available, like new! A spectacular look, unique performance data, consistently lightweight design and the highest degree of exclusivity – these attributes sum up the new 65 AMG Black Series from Mercedes-Benz. The high-performance coupe features pure-bred motor sports technology, and introduces sports car fans to a whole new world in terms of dynamic performance. The AMG 6.0-l V12 bi-turbo engine, developing a maximum output of 493 kW/670 hp and maximum torque of 1,000 newton metres, guarantees the dynamic performance of a super sports car. "When I touched the right pedal gently, the 4-seater glided smoothly along, while all one heard was a whisper. Pushing the foot down hard means changing the character immediately,(the redline begins at 7200), the car roars and its rear tires try to spin from all the torque. But they won't, as long you keep traction and stability control engaged. Switch it off and brute muscle is the answer to any action." 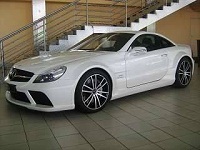 2008 7-speed AMG Speed-shift, paddle shifters,AMG sport bucket seats. Aggressive side bolstering and extensive carbon fiber trim. Up 19kW to 373, the CLK63’s 6.3-litre AMG-designed V8 is powerful enough to push the CLK to 100km/h in just 4.1 seconds, according to Mercedes-Benz. A larger, redesigned intake and freer-flowing exhaust help increase the power, as well as providing more audible growl. 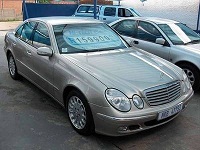 2006, Bal 6 Yr or 120000 Kms Motorplan. 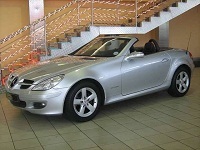 The new Mercedes SLK is absolutely stunning to look at from the outside and this is reflected by the interior also. For the first time i believe that this new model from Merc appeals not only to the women, but also men are looking at the SLK in a different light. The interior reflects the exterior, with a smooth more rounded dash board that feels solid and well put together. The cabin space feels roomier and sportier, especially with having the optional extra of leather bucket seats which adds to the luxury of this vehicle.Overall this car is superb and is a looker and i can guarantee that everyone will be impressed by this car! Interior is everything you would expect of a Mercedes. Beautifully trimmed and finished, ultra comfortable and nicely specified. 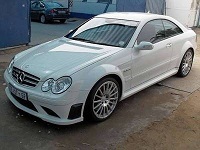 No hint of the build quality issues reported on more recent Mercedes cars - finish is first class. This time I drove an E270 diesel. It was blessed with virtually identical power to the petrol car on paper but in reality the leap in torque produced a smooth wall of power that made the car genuinely fun to drive. At last I understood what everyone had been saying: this was quite possibly the best executive car money could buy. This also guarantees female and male attention.